(Phys.org)—A new model developed by a team of researchers with member affiliations in Argentina, France and Mexico, depicts a possible scenario to explain why gas giants do not migrate into the star they are orbiting during their early stages. 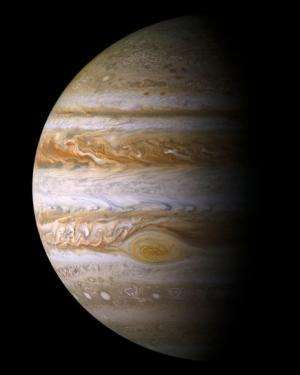 In their paper published in the journal Nature, the researchers note that prior efforts to build a model that could explain gas giant growth and behavior did not take tidal effects into account and thus could not show why they survived. Martin Duncan of Queen's University offers a News & Views piece on the work done by the team in the same journal issue. Gas giants, such as Jupiter and Saturn, exist today because of certain processes that went on during their early development—but until now, no one had come up with a reasonable model to explain those processes—most showed the gas giants migrating into their star during their early stages, rather than spinning away from it. In this new model, the researchers believe tidal effects are the key. It all starts, they note, with a material disk surrounding a nearly born star. Material in that disk crashes into other material and some of it sticks—as that happens over and over more accretion takes place until the evolving planet grows large enough to start capturing gas in its atmosphere. Once that happens, the researchers say something interesting happens—as new material falls through the gas into the solid core of the planet, heat is released. That heat is then transferred back to the surrounding gas, and because the planet is spinning, parts of the gas, ahead of and behind the planet, expand—more so on the trailing side. That results, the researchers claim, in what they call a heating torque that actually pushes the still evolving planet away from its star. The model also suggests that the distance the planet is pushed from its star depends on the material that was in the original disk which made its way to the core of the new planet. Heavier elements would naturally offer more torque, but a planet's eventual resting place would also depend on the size of the planet that formed. The model is just a first step in a new direction in trying to explain how gas giants came to be and where—research will continue both by the team with this new idea and of course by many others in the field. Planetary systems are born in the disks of gas, dust and rocky fragments that surround newly formed stars. Solid content assembles into ever-larger rocky fragments that eventually become planetary embryos. These then continue their growth by accreting leftover material in the disk. Concurrently, tidal effects in the disk cause a radial drift in the embryo orbits, a process known as migration. Fast inward migration is predicted by theory for embryos smaller than three to five Earth masses. With only inward migration, these embryos can only rarely become giant planets located at Earth's distance from the Sun and beyond, in contrast with observations. Here we report that asymmetries in the temperature rise associated with accreting infalling material produce a force (which gives rise to an effect that we call 'heating torque') that counteracts inward migration. This provides a channel for the formation of giant planets and also explains the strong planet–metallicity correlation found between the incidence of giant planets and the heavy-element abundance of the host stars. That results, the researchers claim, in what they call a heating torque that actually pushes the still evolving planet away from its star. expanding gas pushing against what? Heating Torque? You guys are just making crap up. @stevepidge: It is blatantly obvious that it is you who makes crap up, since you confused a post about science with what the paper actually says. "Here we report that asymmetries in the temperature rise associated with accreting infalling material produce a force (which gives rise to an effect that we call 'heating torque') that counteracts inward migration." If you want to know how the force, that has been observed in their model tests*, work, you should read the paper. * And no matter how much crap you make up about scientists 'making crap up', they published it in peer review so it makes sense to their peers and the paper demonstrates the existence of the force in lab (computer) experiments. SHow me the observations, not the MODELS based on models based on more models. Since we are not yet at the technological level to be able to actually build a solar system from scratch, computer modeling is the only technique we have of obtaining data. There is also the consideration of time, since the process in question takes many millions of years to accomplish. Accretion disc dynamics are one of the least understood processes in the universe. It is obvious that a collapsing self-gravitating system does form an accretion disc, we have the observations for that. Yes, they are making stuff up, that is the whole point. It is the stuff they make up that fits actual observations that is the subject here. Since we do not fully understand the dynamics involved, we try many things to see what works. The things that work get incorporated into the next generation of theories. This is the method through which science progresses. Since we are not yet at the technological level to be able to actually build a solar system from scratch, computer modeling is the only technique we have of obtaining data. There is also the consideration of time, since the process in question takes many millions of years to accomplish. Accretion disc dynamics are one of the least understood processes in the universe. It is obvious that a collapsing self-gravitating system does form an accretion disc, we have the observations for that. The formation of planets follows the path of electric currents running through the sun's rotating magnetic field and the solar wind ( Parker spiral). The electrical forces involved will coalesce matter into planets. Further, the observed electrical energy released in so called "magnetic re connection" occurs on the path of the rotating magnetic field. These energies are sufficient to create tremendous attraction between matter where it is available in areas of substantial mass. This is how planets are formed, in a cosmic discharge almost instantly. Further, the observed electrical energy released in so called "magnetic re connection" occurs on the path of the rotating magnetic field. These energies are sufficient to create tremendous attraction between matter where it is available in substantial mass. This is how planets are formed, in a cosmic discharge almost instantly. observed electrical energy released in so called "magnetic re connection"
so you are also an electric universe acolyte? before opening your mouth and proving to the world how stupid you can be, why not research the issue? In my model, the planet orbits at near Keplerian velocity while the gas is slower and is falling starwards. Accordingly the pressure is highest on the leading face, the gas is dragged starwards and the planet begins spinning as if rolling. Once gravity is sufficient, the planet drags the gas in front around underneath it, where it encounters gas in the orbital direction, and two flows in the opposite direction cancel. The planet now takes the angular momentum of the gas, and this slows/stops it falling starwards. You seem to be under the impression you 'can' rotate a magnetic field - around what axis precisely ? Have you heard of the Faraday paradox ? These energies are sufficient to create tremendous attraction between matter where it is available in areas of substantial mass. This is how planets are formed, in a cosmic discharge almost instantly. Highly unlikely as ElectroMagnetic Fields (EMF) sums locally primarily BECAUSE there are no monopoles ie. N <-> S have direct polarisation...! This is just why, despite Sol's field being immense it CANNOT be measured at Earth's surface and just why gravity - with no polarisation always wins out immensely over astronomical distances ! Stevepidge, models r based on physics, well proven, try to understand physics & error bars please ! No. A rotating magnetic field is subject to Faraday paradox - get physics education & not robotically follow vague EU idea. NB. Solar wind is mostly neutral, if it wasn't we would be in for almost regular MASSIVE lightning bolts across the solar plane vapourising differential charge points (ie planets). Please get an education in Electrodynamics ! No. EMF weak, gravity is fine !